PLEASE CLICK on the thumbnail picture for a larger picture! Then, just X out the pop-up window to return to this page! 4312 - 1987 " St. Nick Character " lidded stein. SS91AC - 1991 " Santa's Sleigh Alpine Christmas " lidded stein. 93XMAS - 1993 " Santa Down The Chimney Christmas " lidded stein. 6761 ï¿½ 1994 " Merry Christmas Chapel " lidded stein. HALL - 1994 " Hallmark Old World Santa " lidded stein. SNOWM - 1994 " Snowman Christmas " lidded stein. 96XMAS - 1996 " Santa in Sleigh Christmas " lidded stein. 3986 ï¿½ " Winter Victorian House " lidded stein. 4037 - " Gerz Christmas " lidded stein. 4513 ï¿½ " Old World Santa Musical " lidded stein. 4514 ï¿½ " Old World Santa " lidded stein. ROTH01 ï¿½ 2001 " Rothenburg Christmas in Germany " lidded stein. 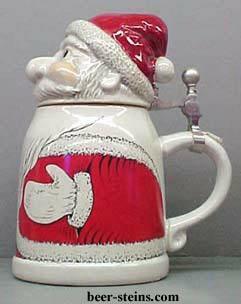 4629 ï¿½ 2003 " Alpine Santa Musical " lidded stein. 6409 ï¿½ " Christmas " lidded stein. 6422 - " Santa with Children Christmas " lidded stein. 6442 - " Christmas Eve " lidded stein. 6568 - " Nutcracker Suite " lidded stein. SANS - " Santa's Sleigh " lidded stein.